"Microaggressions are the everyday verbal, nonverbal, and environmental slights, snubs, or insults, whether intentional or unintentional, that communicate hostile, derogatory, or negative messages to target persons based solely upon their marginalized group membership"
Discussing racial microaggression is always challenging. Anyone who is rightfully called out for any deliberate or unintentional act of racism that to them may appear slight will deny their misstep in defiance of being branded a racist. Despite all this, I am entering this moment of trying to speak truth to power through this example to open a dialog that might help reduce such behavior in the autism community with no hope that it will be understood much less heeded. We are living in one of the worst times for racial aggression and maltreatment since the beginning of the New Jim Crow era. Seeing racist constructs in an essay written by an author appropriating rare genetic disorders linked to people our race as a convenient literary allusion for any argument adds an additional layer of sad disappointment. That was my initial reaction to such an allusion used in a disturbing essay about autism labeling by Stephen Prutsman. "Consider for a moment if “African American” and “Sickle Cell Anemia” were grouped together; let’s call this hypothetical grouping “AASCA." For some, it would be a beautiful identity full of rich culture, heritage and uniqueness. For others, it is a serious blood disorder found predominately in people of African descent. One can only imagine the confusion, misunderstanding and pain that would ensue if scientists were to lump both under the same category." The use of the term "African Americans" as a monolithic grouped object and "Sickle Cell Anemia" as an objectified construct in a literary allusion in this manner promotes the subliminal message of the "diseased Black" vs the "healthy Blacks." The reduction of a marginalized group to a construct and placement of a disabled subgroup within that population in implied opposition to the nondisabled group is not only ableist it is a dehumanization created solely to instill discomfort and guilt needed to win a written argument. This falls into a specific category of racial microaggression called microinvalidation. 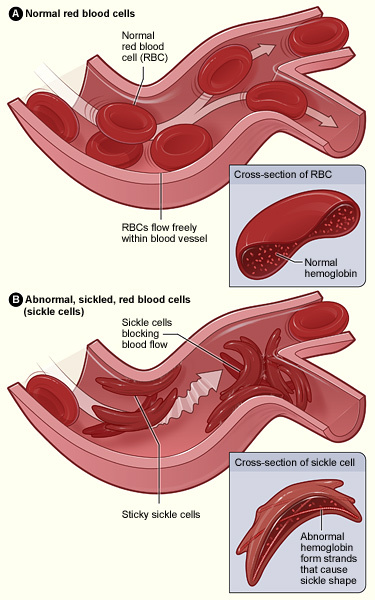 No one who shares my race would use African American and Sickle Cell Anemia in any allusion about anything because right now, there is a crisis causing premature deaths in African American Sickle Cell patients directly due to race-related disparities in health care, health research, and education of medical teams. Sickle cell patients suffer bouts of excruciating pain as impacted organs fail, and their suffering is frequently ignored by ER staff believing African Americans have a high tolerance for pain, an old stereotypical holdover from the age of using and abusing the Black body for medical experimentation. Add to this the stereotype that African Americans may be asking for opioids because they are more likely to be drug addicts and you have a perfect storm of racism. The allusion Prutsman makes of lumping the rare genetic pool of Sickle Cell with the total population of African Americans makes absolutely no sense when in fact the ability to gain the genetic counseling, services and supports African American Sickle Cell trait and disorder clients need absolutely requires identifying as either a carrier of the trait, or a patient needing health supports and services throughout their lives. Mr. Prutsman's allusion appears to show his complete lack of understanding about invisible and apparent disability and the importance of identity in gaining access to lifelong services and healthcare supports. Every marginalized group within any community progress by reclaiming or owning labels used to limit or marginalize them and empowering such labels by making them part of a greater individual identity. The term "Black" was reclaimed when I was growing up, and as I and hundreds of other students of color in my generation entered all-white schools to insults, attacks, and abuse, James Brown's "I'm Black and I'm Proud" and similar reclamations of skin color as identity kept our heads up. Sickle Cell Trait and Sickle Cell disorders in all stages are both the disability and the disabled identity of those who are diagnosed. There is a long, painful history involving the African American community and modern medicine and the lack of advancement in the supports and treatment of Sickle Cell patients in adulthood is part of it. We have been subjected to experimentation, sterilization without consent, endemic disparities in medical care that have created another race-based health crisis in America. We women who are African American are dying in pregnancy and childbirth in numbers not acceptable anywhere, much less in a so-called developed nation. I have spent years trying to think of a way to explain the insult in stereotypical racial microaggressions ingrained in white society that use the monolithic construct of "African American" as an object in literary allusions that dog whistle racism as a method to make an example that they believe will offend others enough to hammer some trivial point home. In this example, I can only guess the author intended to invoke a genetic illness which in his mind would evoke sufficient pity and validation as a catastrophic enough condition to make his essay readers uncomfortable when paired with "African American." But in this moment, where white people are calling 911 on young girls of color selling water, on this anniversary of the death of Tamir Rice, it is not acceptable to use African Americans and rare disabilities in any attempts to dominate the autism or any other unrelated conversation. Researchers believe that the cumulative impact of racial microaggressions over the lifespan of a marginalized group are more damaging to minorities they target than any single blatant incident of overt racism. There are now ongoing attempts to make POC aware of these microaggressions so that they can act to reduce their impact. At the same time, professionals are trying to educate perpetrators of racial microaggressions while letting them know that intentional or not, such acts cause widespread harm to marginalized people. Mr. Prutsman could have found any number of literary allusions to make his point without the misuse of African Americans and disabled African Americans. Futhermore, as the Black mother of an autistic son, the use of such offensive constructs alienates me and my disabled son from the autism conversation and this is unacceptable, because we have a right to representation in this community. The hashtag #AutisticWhileBlack was created because macro and microaggressions are embedded in the structure of autism advocacy and it needs to end. Let's begin to make to an effort to improve diverse representation in the autism conversation by not repeating combined racist-ableist gaffes like this one. By Sue, Derald Wing, Capodilupo, Christian M., Holder, Alisha M. B.